For a limited time, a selection of Erin Hanson originals will be on display at the popular wine-lover destination Messina Hof in beautiful Grapevine, Texas. You are invited to sip fine wines and admire the wondrous paintings of Erin Hanson in this historical landmark. Pontotoc Winery presents the works of popular Open Impressionist Erin Hanson for one weekend only. Erin Hanson's captivating landscapes will hang from Friday through Sunday. The Erin Hanson Gallery invites you to a special celebration of motherhood. Some of you have heard that Erin Hanson is pregnant with her first child! A little girl is due in July of 2019 and Erin is tickled pink to celebrate the baby's arrival with a festive affair of floral paintings. One of the top art fairs in the U.S., the San Diego Festival of the Arts brings world-class artists to San Diego. Come to the show to find the perfect artwork for your home. Erin Hanson: American Vistas will present the diverse and uniquely picturesque paintings of contemporary impressionist Erin Hanson (b. 1981). Hanson's works range in subject matter from our nation’s natural parks to the furthest reaches of both coasts. 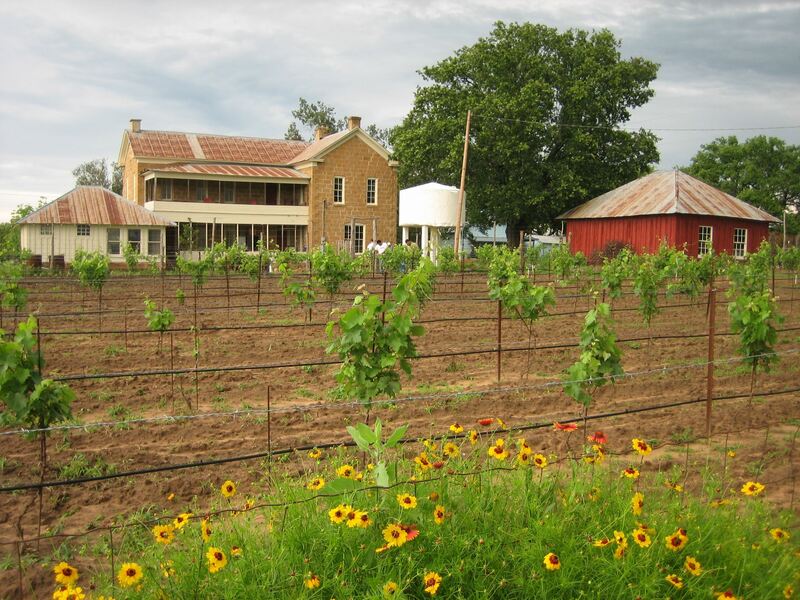 Dorothy Jean Wines invites you to join the wine makers and label artist to celebrate the release of their anticipated 2019 Chardonnay. 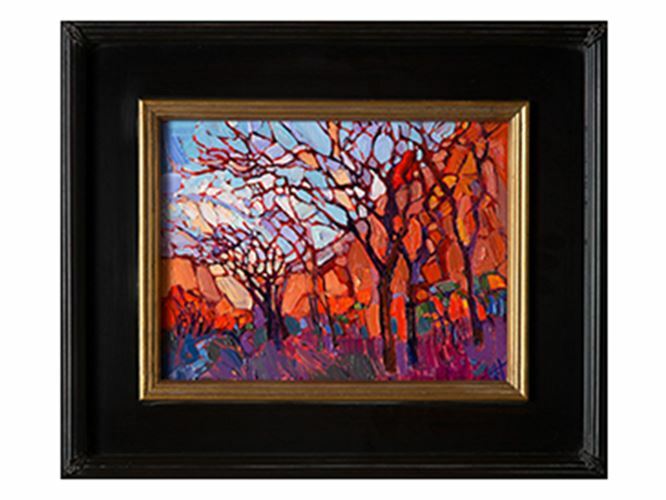 The label artwork features a piece by popular California-based impressionist, Erin Hanson. This collaboration marks the marriage of visual arts with the time-honored tradition of finely crafted wines. 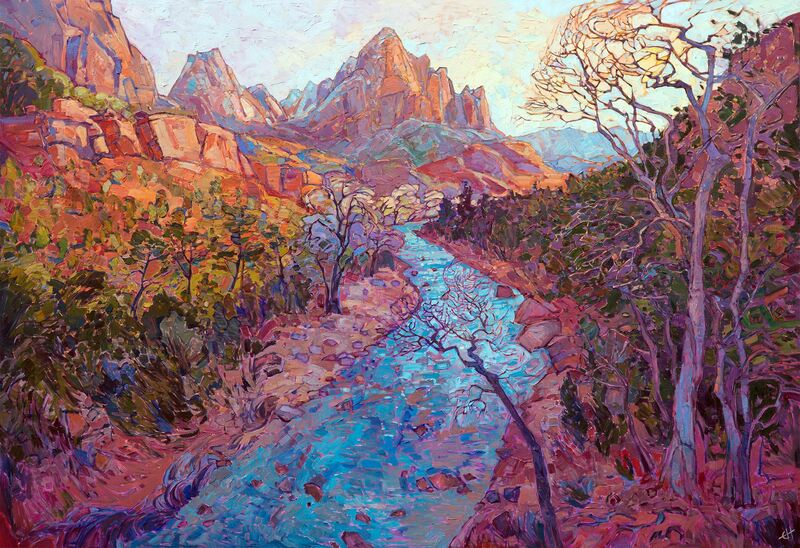 Come explore Erin Hanson: Impressions of Zion, a special art exhibition at the Zion National Park Museum. Zion has been an inspiration for dozens of famed artists throughout history. We are honored to continue the tradition of art inspired by our national parks. 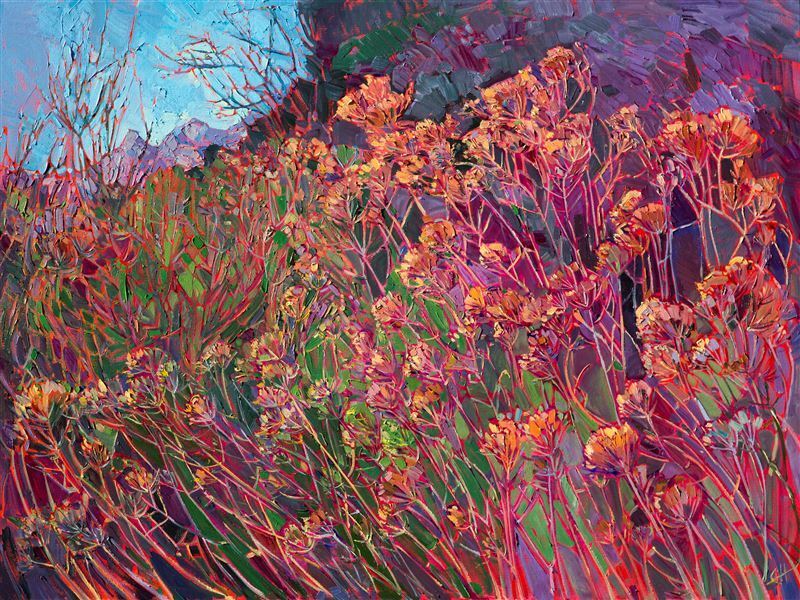 The Santa Paula Art Museum presents a solo exhibition by Erin Hanson. Erin Hanson: Colors of California will mark Hanson's most comprehensive collection of California's multitudinous landscapes, inspired by Ventura County, Santa Barbara, and northwards to Paso Robles and Monterey and beyond. In 2006, Desert Caballeros Western Museum embraced a revolutionary idea: an annual exhibition showcasing the brightest contemporary female artists working in the Western genre. 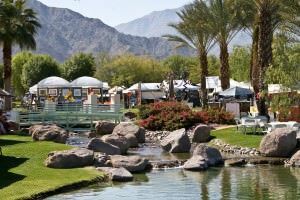 Ranked as the #1 art festival in the US, the La Quinta Arts Festival is held outdoors in the beautiful green Civic Center park. Hundreds of world-renowned artists show at this 4-day festival. The park is beautiful, with duck-filled ponds and palm tree-lined greens. The Erin Hanson Gallery invites you to celebrate our second anniversary in San Diego. After operating in Los Angeles for five years, the gallery relocated to San Diego, and we have been enjoying San Diego's alluring and diverse environment ever since. 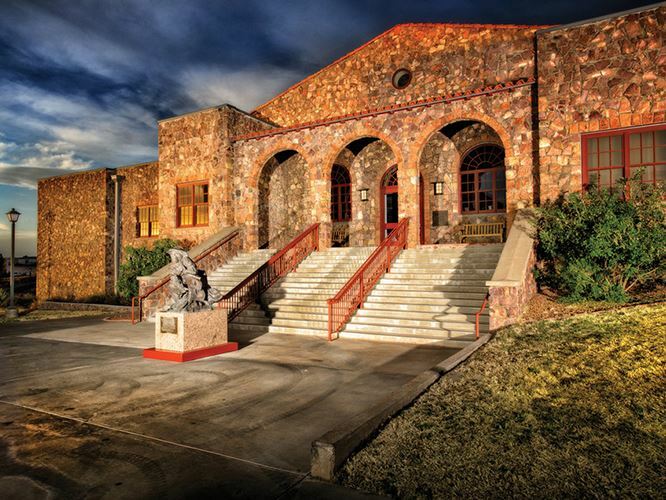 The Museum of the Big Bend presents an exclusive collection of oil paintings inspired by southern Texas' Big Bend Country. 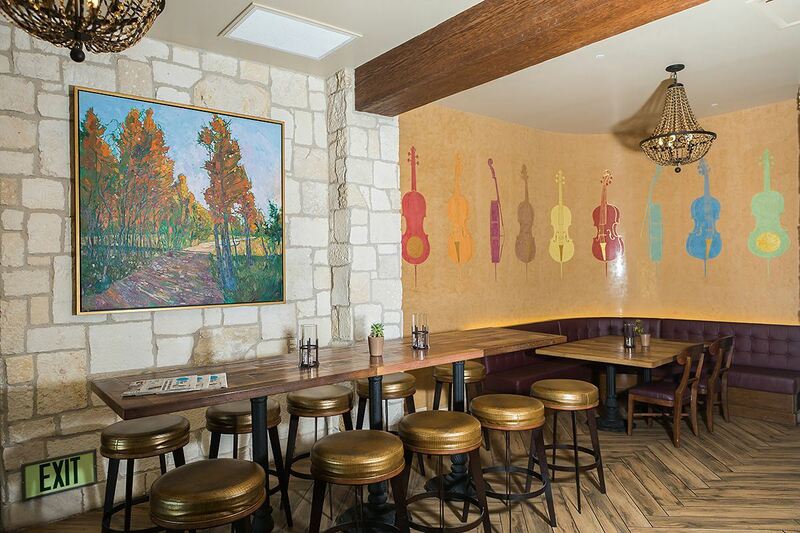 These paintings capture the natural beauty and open space of Texas, in a modern impressionistic style that is alive with color and texture. Come discover Erin's petite oil paintings, the perfect gift or treat for any lover of impressionism. These small canvases are masterpieces of color and light, each brush stroke a deliberate expression by the artist. 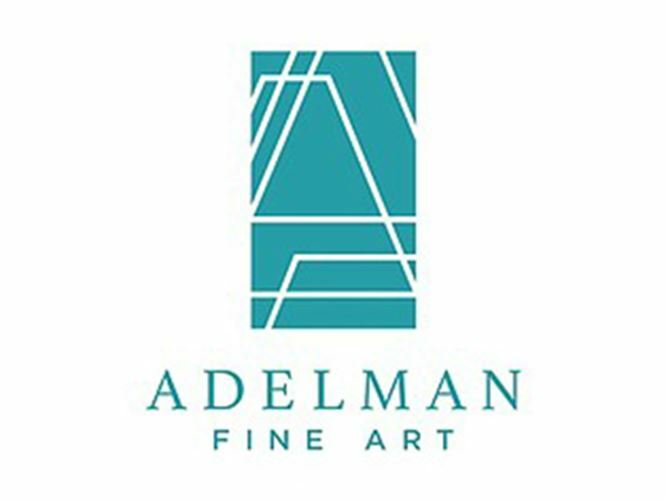 Adelaida Vineyards and Winery presents the works of popular Open Impressionist Erin Hanson for one weekend only. Erin Hanson's captivating landscapes will hang from Friday through Sunday. Dorothy Jean Wines invites you to join the wine makers and label artist to celebrate the release of their anticipated 2017 Chardonnay. 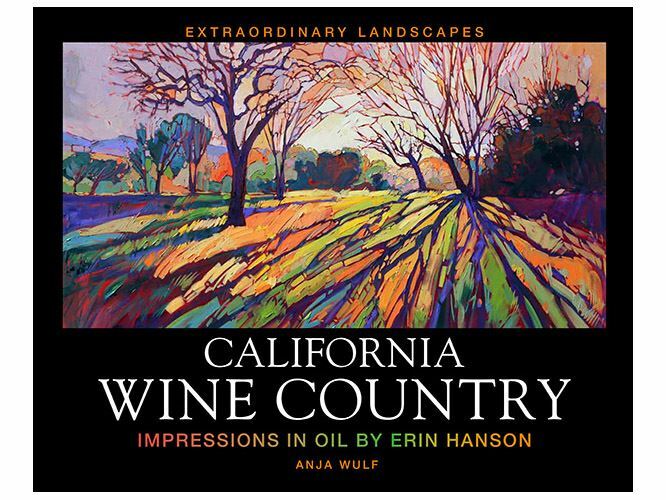 The label artwork features a piece by popular California-based impressionist, Erin Hanson. This collaboration marks the marriage of visual arts with the time-honored tradition of finely crafted wines. 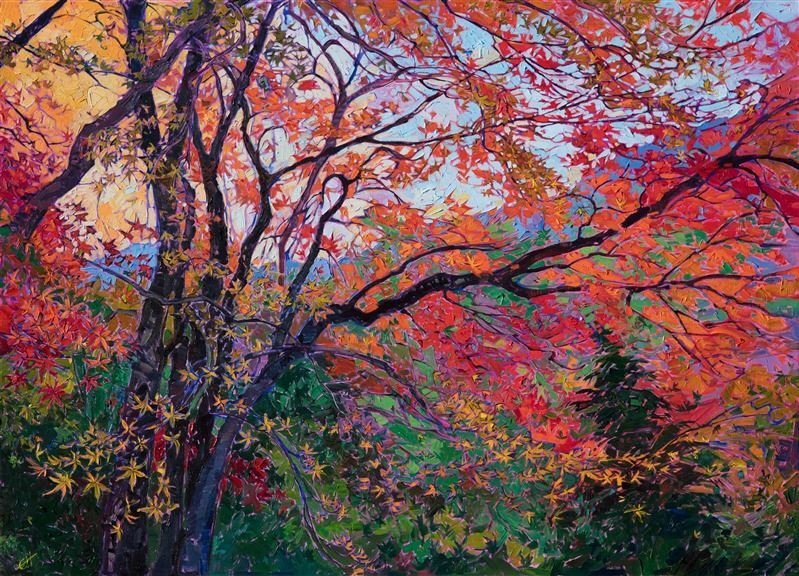 The Erin Hanson Gallery presents a new collection of fall color paintings by contemporary impressionist Erin Hanson. This 20-piece collection of works will be an exploration of fall and the magnificent colors found within the season. 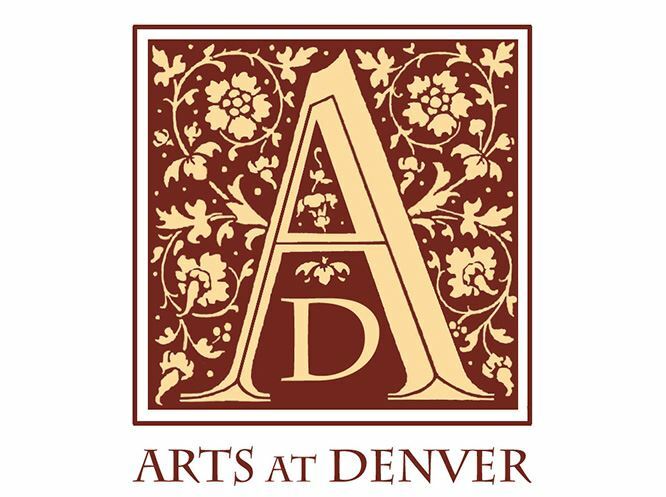 Arts at Denver gallery presents an exhibition featuring Margaretta Caesar, Erin Hanson and Cynthia Rosen. Now in their 46th year, the Harvest Festival Original Art & Craft Show is known as one of the West Coast's premiere shows. 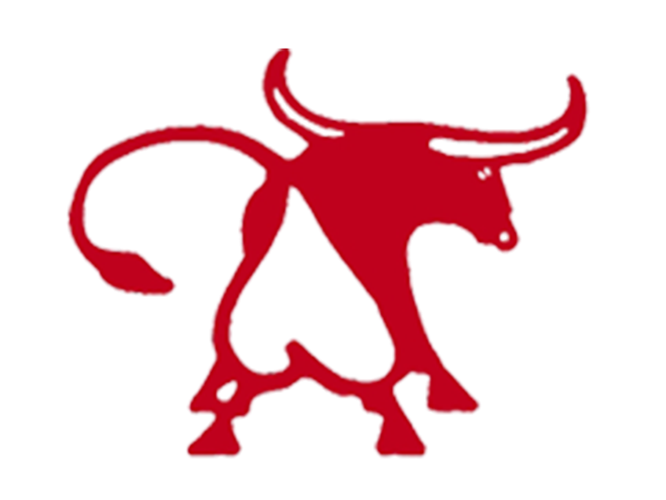 The 2018 La Jolla Art & Wine Festival returns to La Jolla for its tenth annual season on October 6th and 7th in the heart of the village, on Girard Ave. 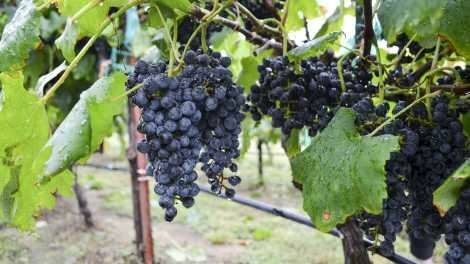 This two-day juried art show and fundraiser has quickly garnered a reputation as one of the most prestigious art and wine festivals in Southern California. The La Jolla Art & Wine Festival is FREE and open to the public. 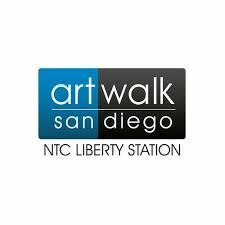 In 2018, ArtWalk @ Liberty Station celebrates 13 years of bringing visual arts, music, and interactive art-making for families to San Diego in beautiful Ingram Plaza at the Arts District at Liberty Station. The Arts District at Liberty Station has blossomed into San Diego’s premier venue for the arts, museums, dining and entertainment. 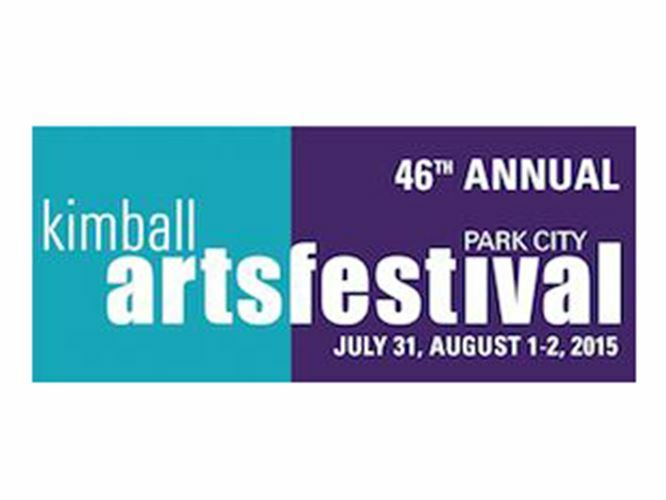 The Kimball Arts Festival presents a full weekend of activities and fantastic artwork from around the country. The ski slopes of Park City are green and verdant in the summer, forming a beautiful vista around the festival. 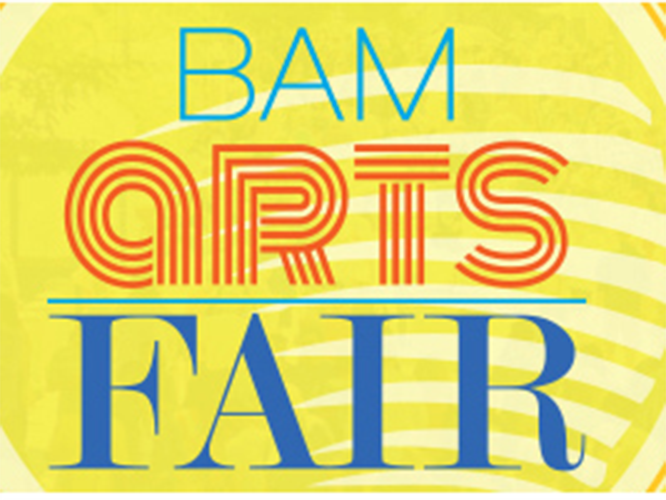 The 72nd Annual BAM Arts Fair features over 300 fine artists and craftspeople. 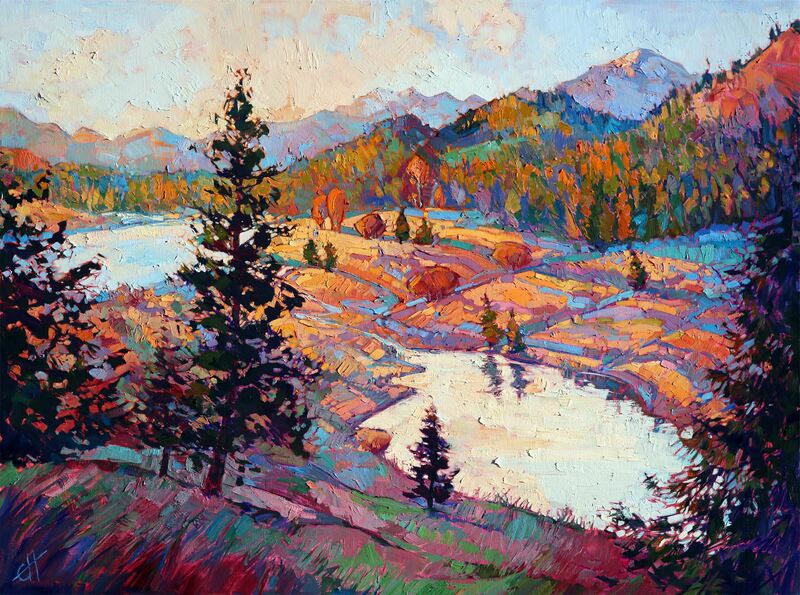 Visit Erin Hanson's booth to experience her colorful and dramatic contemporary impressionist oil paintings. The historic California Art Club presents its signature exhibition, spotlighting more than 200 sculpture and paintings of genres ranging from landscapes and seascapes to figures and still lifes. The exhibiting artists include nationally renowned representational artists who have been active in expanding interest in the California Impressionist heritage associated with the organization’s founding in 1909. 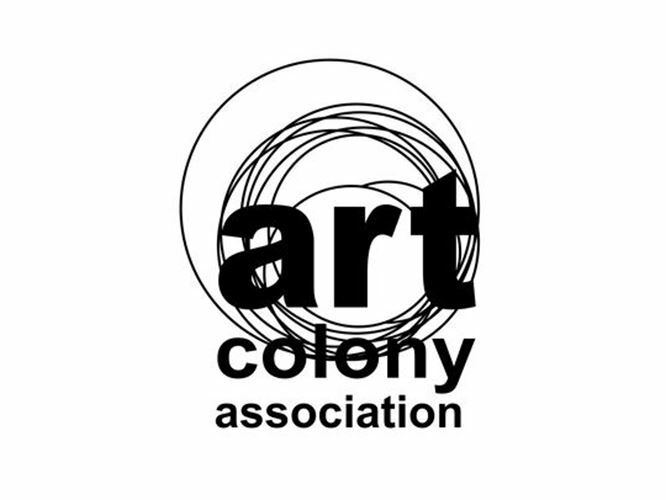 While the artists employ time-honored fine art techniques, their featured works seek to innovate with modern messages that address societal issues from diversity to the environment. 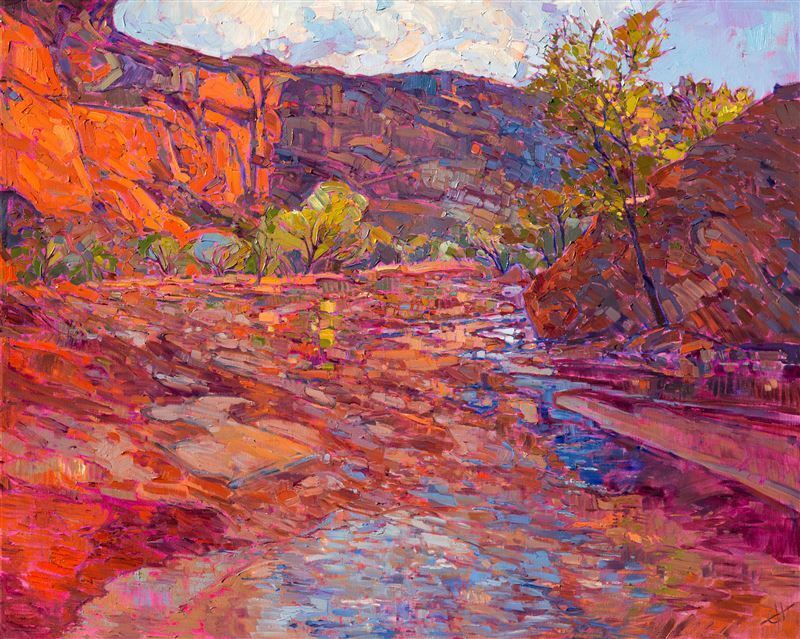 The Erin Hanson Gallery presents a new collection of Red Rock paintings by modern impressionist Erin Hanson. Her contemporary impressionism paintings breathe fresh color into traditional Western landscapes. 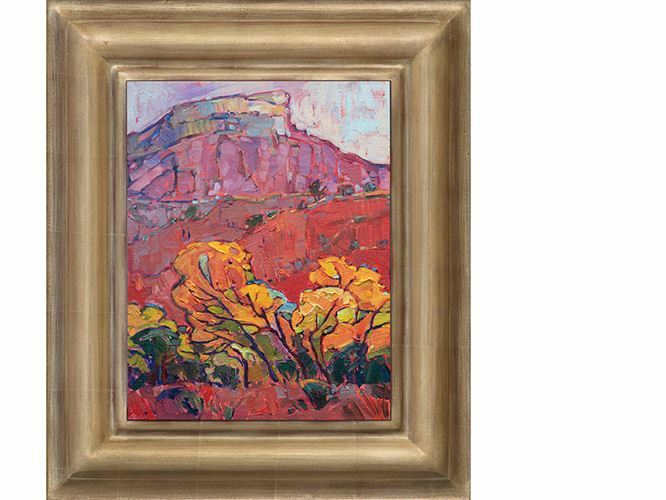 This collection will feature pieces inspired by Hanson's travels through the National Parks and Monuments of Utah, Arizona, Nevada, and Colorado. How many ways do artists celebrate a season? Spring will always mean a time for quiet growth....color.... and renewal. The fascination with this season shows in the many ways artists put paint to canvas and celebrate the shapes and colors, the light and drama, and the amazing energy of growth which create paintings that delight us. View a wide collection of fine art in the beautiful setting of Lincoln Park in the South Bay. Join us for special celebration of motherhood with fresh fruits, champagne and fine art. All mothers get a special gift! 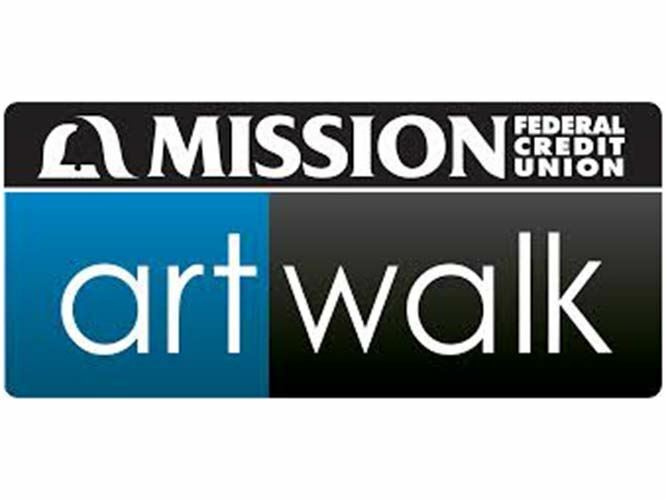 For 34 years, Mission Federal ArtWalk has celebrated both visual and performing arts in San Diego. We believe art has the power to connect communities, cultivate new artistic talent and create a better quality of life for all through cultural enrichment. The Southlake Art Festival has risen in popularity and artist quality to become nationally ranked as one of the top art festivals in the U.S.! Don't miss this event -- now is the chance to find that perfect piece of art to complement your home. Winner of Best in Show, and returning in 2018 as the Featured Artist and Poster Artist, Erin Hanson attends this aesthetic outdoor festival which is nationally ranked as number 3 in the country. 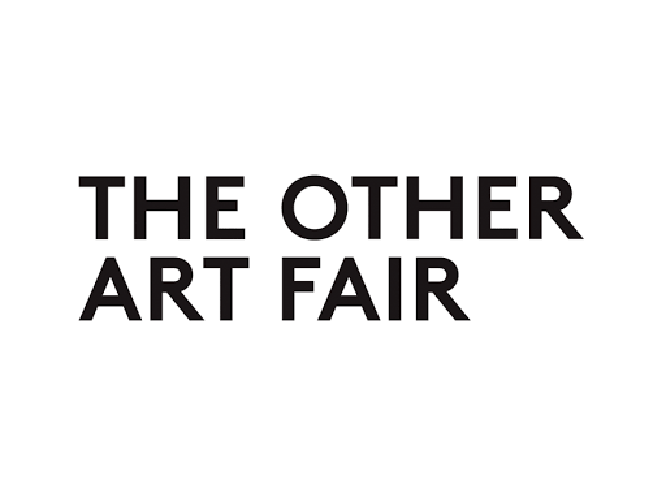 The finest artists travel from across the United States to participate in this quality art show. 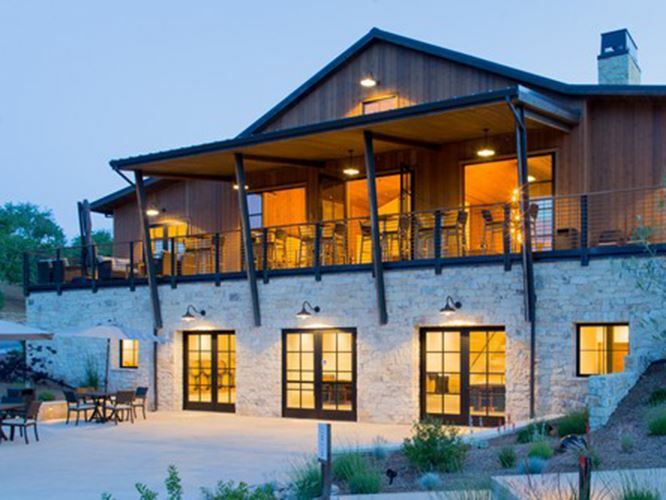 We invite you for a special evening at the Allegretto Vineyard Resort in beautiful Paso Robles, California. This Tuscan-style retreat houses several works by the famed contemporary impressionist Erin Hanson and for a limited time she will be available for a special reception and “meet the artist”. 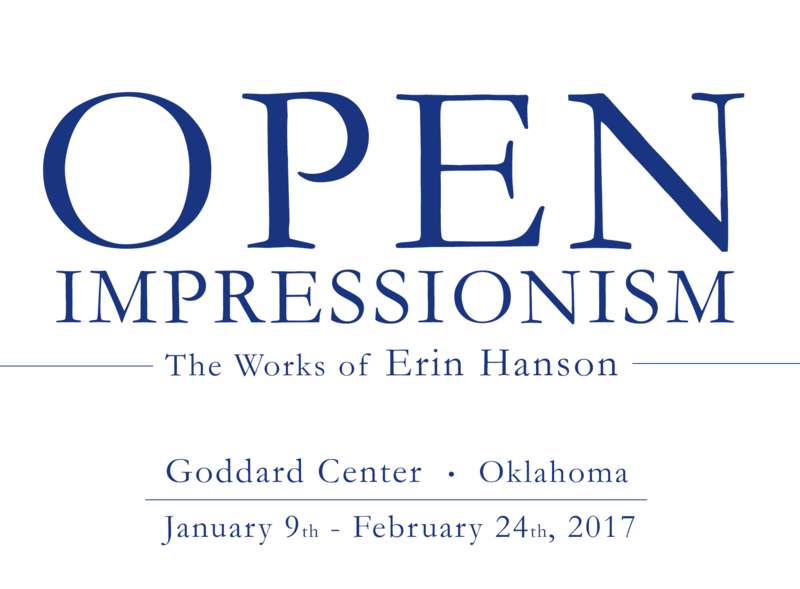 "Open Impressionism: The Works of Erin Hanson" features a 10-year retrospective of Erin Hanson's paintings, showing the development of Open Impressionism and including many never-before-seen paintings from the artist's private collection. 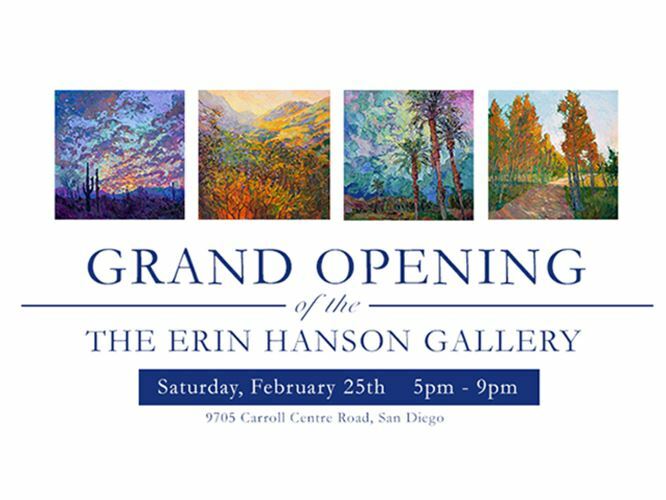 The Erin Hanson Gallery invites you to the Anniversary Event, celebrating our one-year anniversary in San Diego. After operating in Los Angeles for five years, the gallery relocated to San Diego, and we have been enjoying San Diego's alluring and diverse environment ever since. Erin Hanson's impressionistic landscapes have been received by our new city with open arms, and we are proud to celebrate a very successful first year in San Diego. Dorothy Jean Wines invites you to join the wine makers and label artist to celebrate the release of their anticipated Chardonnay at the artist's San Diego gallery. 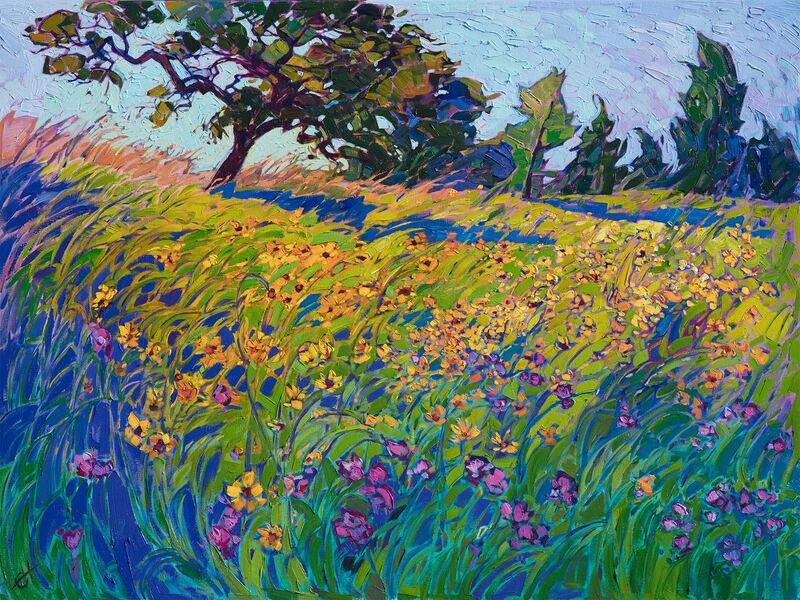 The label artwork features a piece by popular California-based impressionist, Erin Hanson. This collaboration marks the marriage of visual arts with the time-honored tradition of finely crafted wines. 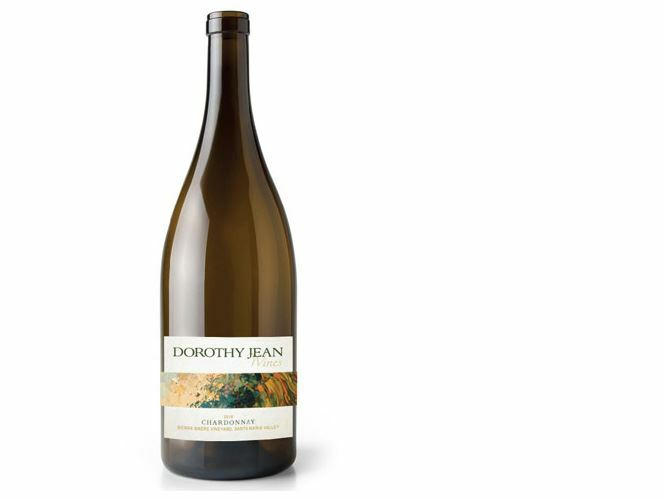 Dorothy Jean Wines invites you to join the wine makers and label artist to celebrate the release of their anticipated Chardonnay. 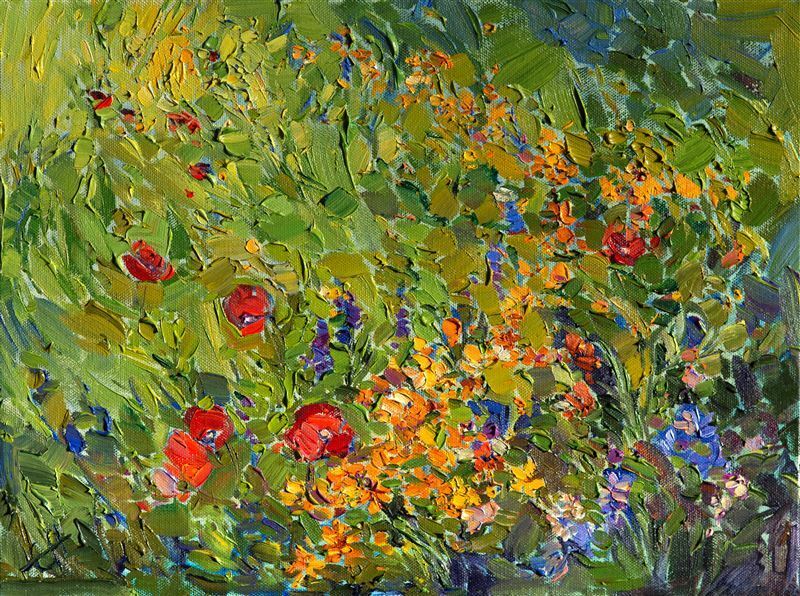 The label artwork features a piece by popular California-based impressionist, Erin Hanson. This collaboration marks the marriage of visual arts with the time-honored tradition of finely crafted wines. Visit Erin Hanson in beautiful downtown La Jolla, on Girard Ave. This is Erin's first time at the La Jolla Art and Wine Festival. Admission is free. 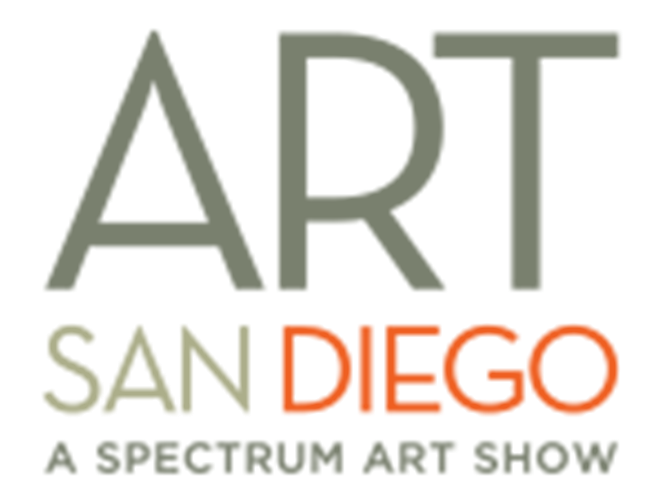 Art San Diego—a juried, contemporary art show in the heart of southern California featuring an international slate of artists and galleries. The Erin Hanson Gallery presents a new collection of super bloom paintings with fields of lush wildflowers and iconic blooming ocotillos in Erin Hanson's signature open impressionistic style. The Erin Hanson Gallery presents a summer-long exhibition and pop-up gallery space in the heart of La Jolla on Girard Ave, located next door to Pharmaca and across from Sur La Table. 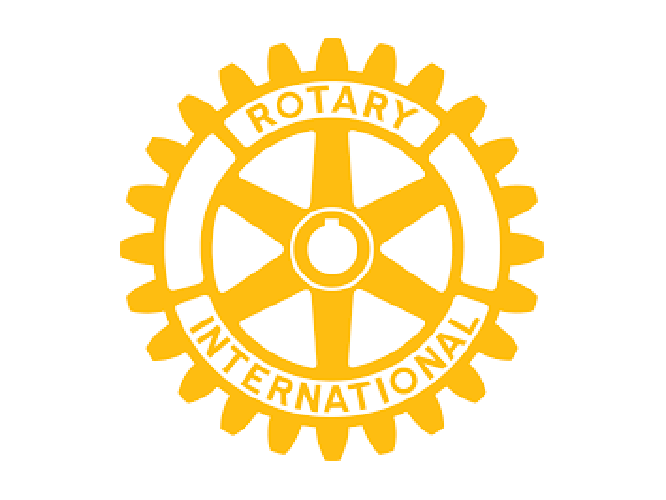 The Sausalito Art Festival will be one of the most memorable and enjoyable events you will ever attend! With fantastic live music and quality artists showing their works from across the country, this festival is one you don't want to miss! 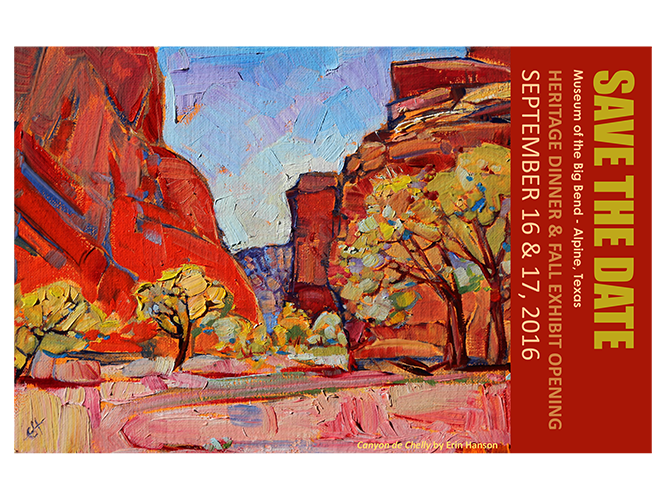 Come explore Impressions of Zion, a special art exhibition at the Zion National Park Museum. This two-month exhibition features the works of contemporary artists Erin Hanson and Royden Card. Each artist has a unique style and will bring new vibrant color to Zion's familiar landscapes. In its 12th year, ArtWalk NTC @ Liberty Station Celebrates Creativity. 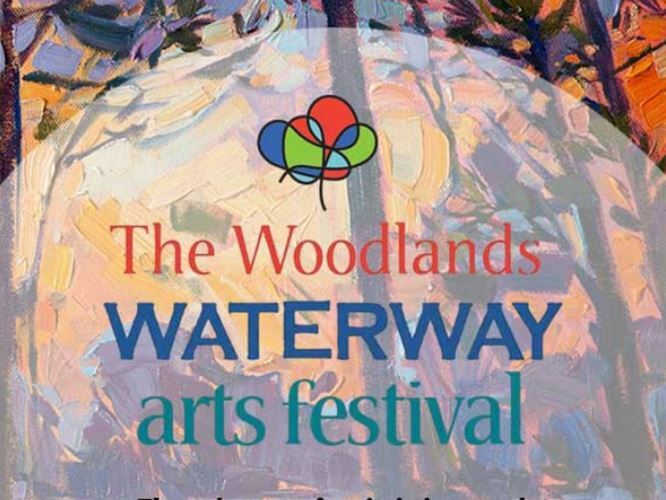 Attendees will enjoy the opportunity to purchase artwork from more than 175 fine artists, all in a beautiful al fresco setting, plus live music, interactive art for adults and kids, and delicious street food options. 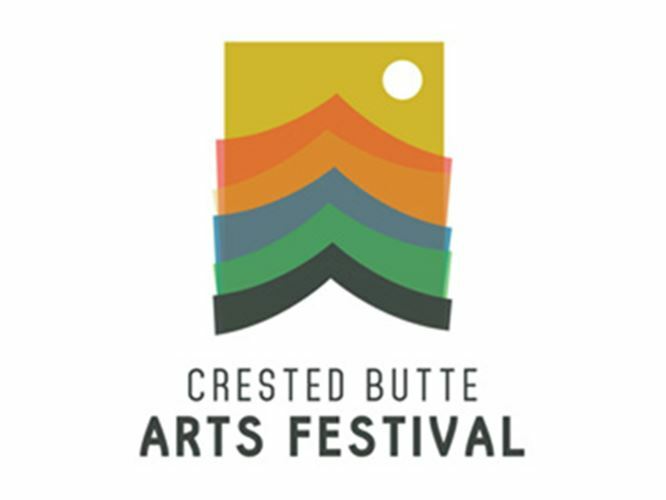 Visit the Bellevue Festival of the Arts for the best fine arts festival in the Northwest, the last weekend in July, in front of Cost Plus World Market. Erin Hanson brings together a special collection of 20 coastal paintings inspired by the beautiful seascapes from San Diego to Monterey. Her unique perspective on the outdoors is captured in her vibrant and colorful oil paintings. This collection will be available for viewing on Saturday, June 24th, at The Erin Hanson Gallery. The 43rd annual Western Art Show & Sale, presented by the Phippen Museum, is a rare showing of all-original paintings and 2-dimensional artworks. This show includes many well established Western artists, as well as new up-and-comers. 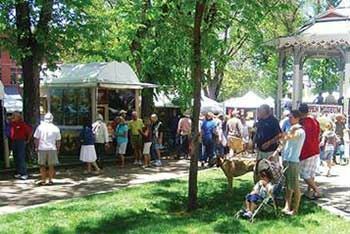 The show takes place in the beautiful, tree-lined grounds surrounding the historic courthouse in downtown Prescott. Visit The Erin Hanson Gallery for a special all-day event! Meet the artist, Erin Hanson, and enjoy her newest collection in a beautiful gallery setting with live music accompaniment. Wine and mimosas will be served, along with hors d'oeuvres. Meet Erin Hanson at Art City Austin, at the beautiful grounds of the Palmer Event Center. 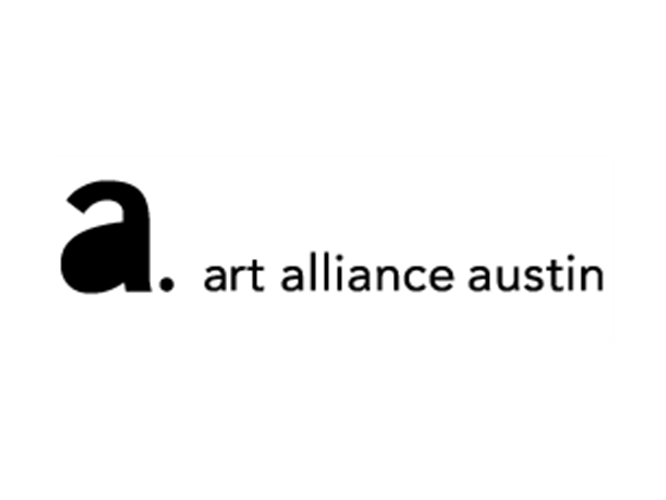 The finest art festival in Austin, this show collects together the best artists from Texas and nearby states, as well as hosting the best local musical talent around! Meet Erin Hanson and view her newest collection of Texas landscapes at the Bayou City Art Festival. The annual Art Festival at Memorial Park attracts artists from all over the country to show their paintings, photography, and sculptures at this elite show. The Desert Caballeros Museum puts on a show every year featuring 58 women artists who capture the West in their artwork. This show will be featuring three of Erin's works, which will be on display at the museum from March 24th - May 7th, 2017. View the works of Erin Hanson at San Diego's Adelman Fine Art Gallery in Little Italy. This special exhibition features the works of San Diego-based artists and focuses on beautiful landscapes and captivating blooms. Visit the Museum of the Big Bend to view several petite oil paintings on display by Erin Hanson. The show, A Feeling of Humanity, is the result of curator Ken Ratner’s focused collecting of contemporary Western artists. His collection features thirty-seven artists and sixty-three works of art. 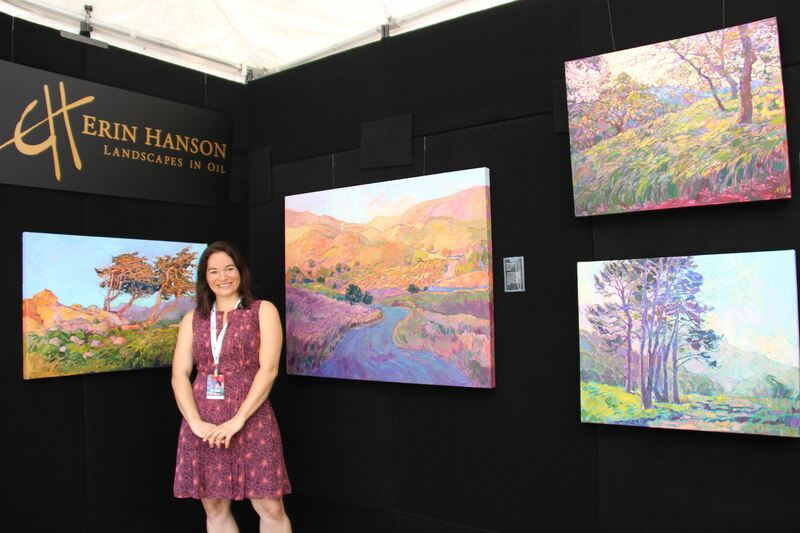 Meet Erin Hanson at the Scottsdale Arts Festival. 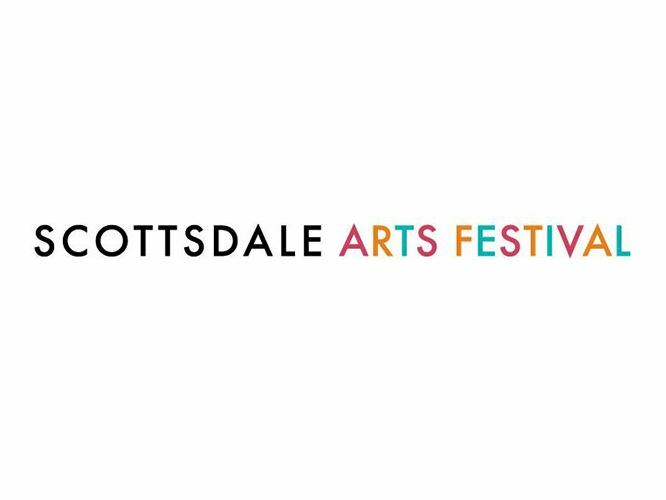 An award-winning show of top-notch artists from across the country, the Scottsdale Arts Festival is a must-see event. Enjoy live music performances, original paintings, fine jewelry, and stunning scultpure all weekend long. 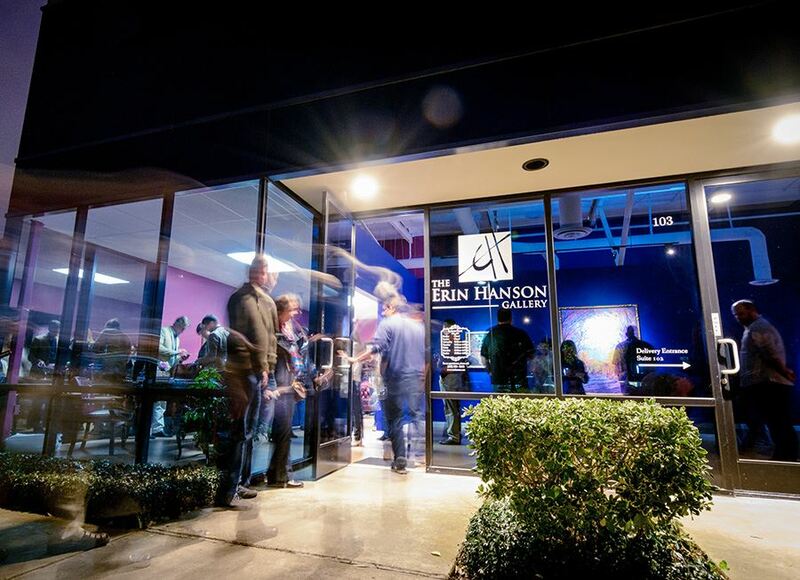 The Erin Hanson Gallery is re-locating to beautiful San Diego. Join us to celebrate the Grand Opening with a brand new collection of Hanson originals. The new gallery and studio space will be open to the public on Saturday evening, February 25th. 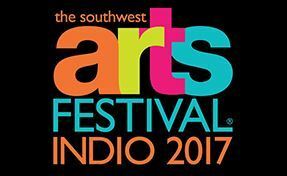 Located at the world-renowned Empire Polo Club in Indio California, a Coachella Valley landmark, the Southwest Arts Festival features the desert's natural landscape and sweeping mountain ranges. Come experience Arizona's prestigious Mountain Oyster Art Show, one of the oldest and best known contemporary western art shows in the country. For over four decades emerging and established western artists have shown their works in the historic setting of the Mountain Oyster Club. Please visit the website for more show information. 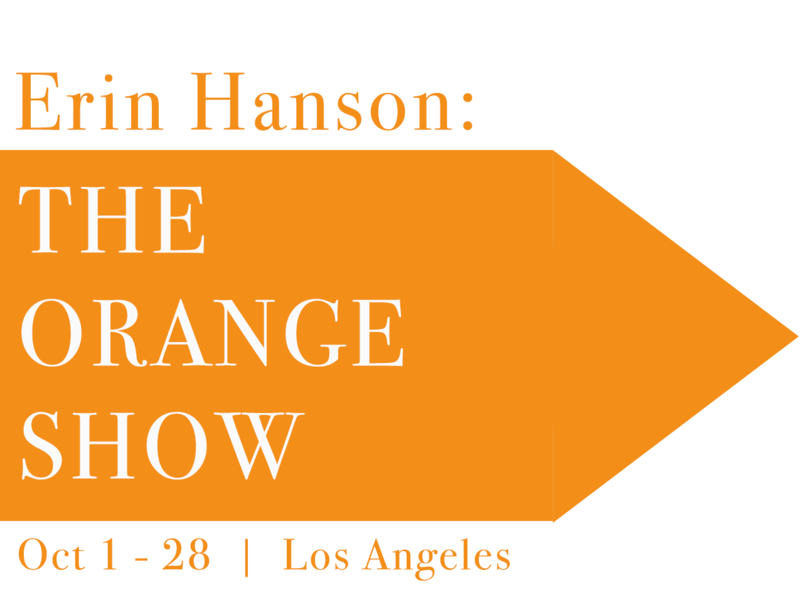 A collection of Hanson's petite landscapes will be unveiled at this open house and reception at her eponymous Los Angeles gallery. 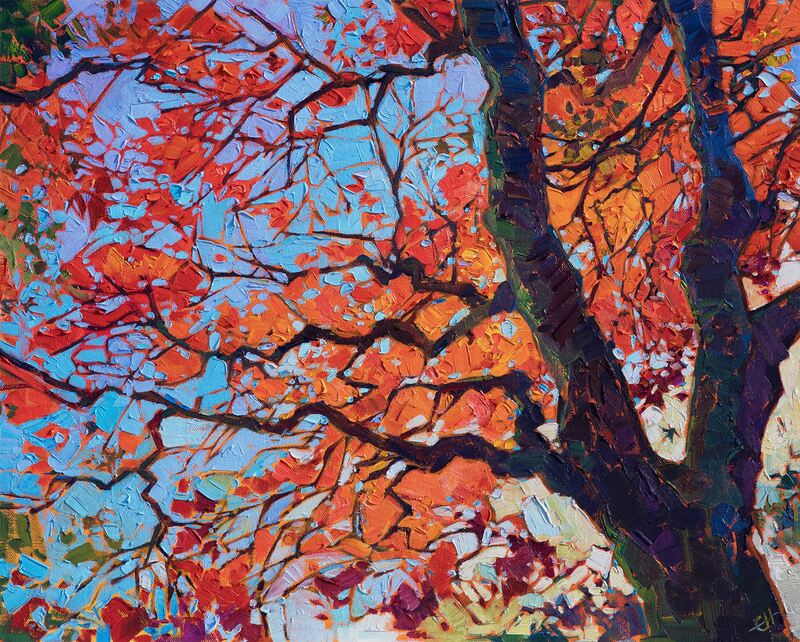 Los Angeles-based artist Erin Hanson will be presenting contemporary impressionist landscapes with orange as the predominant color. These paintings will be featured at her LA Gallery for a limited viewing. 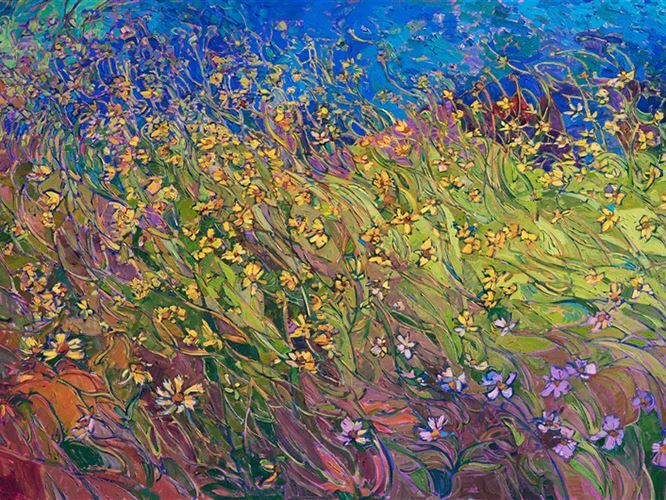 Experience the delightful and diverse scenery found across the state of California through the magical impressionistic landscapes of artist Erin Hanson. 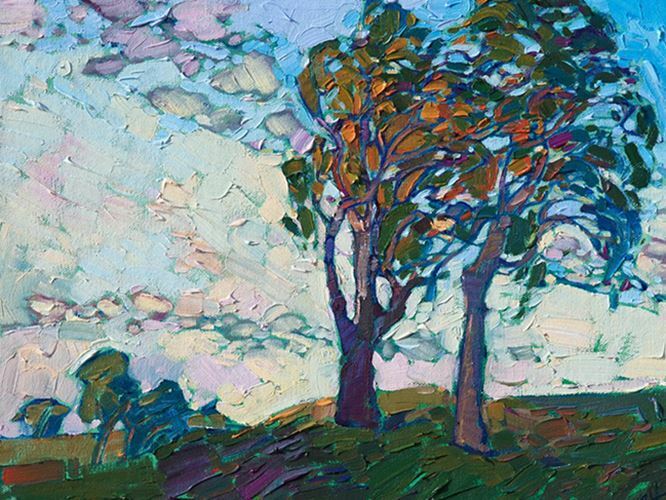 A rare impressionistic painting demonstration by Erin Hanson. Erin completes a complete painting within the three hour allotted time while answering questions and conversing with the audience about her inspiration and journey as one of the top impressionistic masters of our era. Open Impressionism Volume II takes you through the progression of Erin Hanson's rise from inspired explorer to a contemporary impressionistic master. Join us in celebrating this most recent tribute at her Los Angeles based gallery. Join Erin Hanson and dozens of other talented artists this year at the Hermosa Beach ArtWalk! 2016 marks the National Park Service's 100th year anniversary! 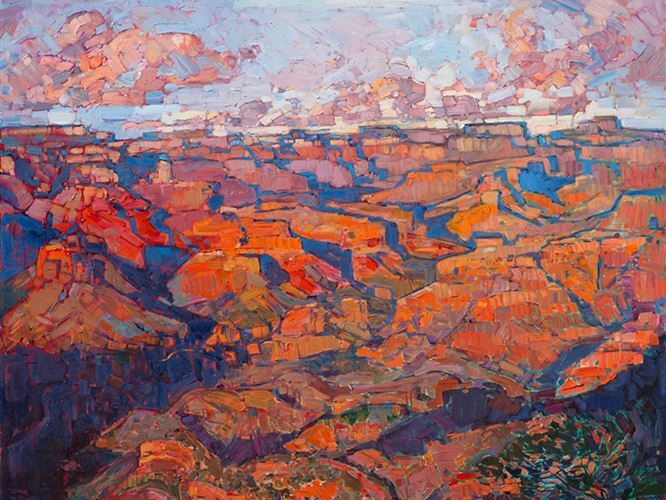 The St. George Art Museum will be kicking off the centennial with Erin Hanson's Painted Parks, an exhibit of Hanson's colorful, contemporary impressionistic landscapes of our National Parks. The exhibit will be hanging from January 16th until May 28th, 2016. A special event for visitors of Zion and St. George Utah in early 2016. 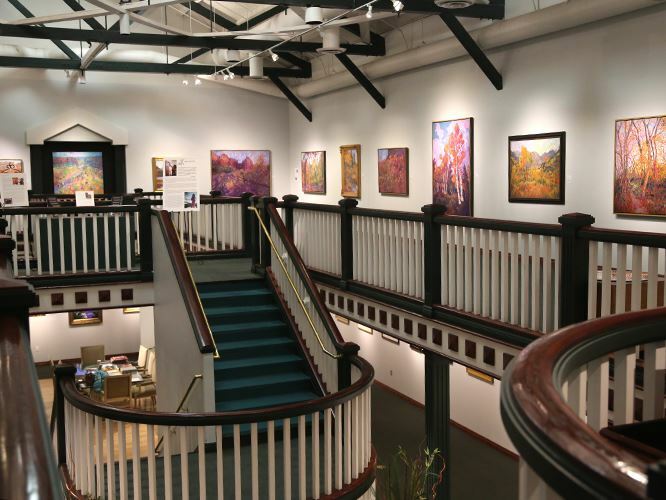 Listen to artist Erin Hanson discuss her Painted Parks collection at the St. George Art Museum. A rare chance to engage with the artist and ask questions, learn about her inspiration and favored locations of exploration. 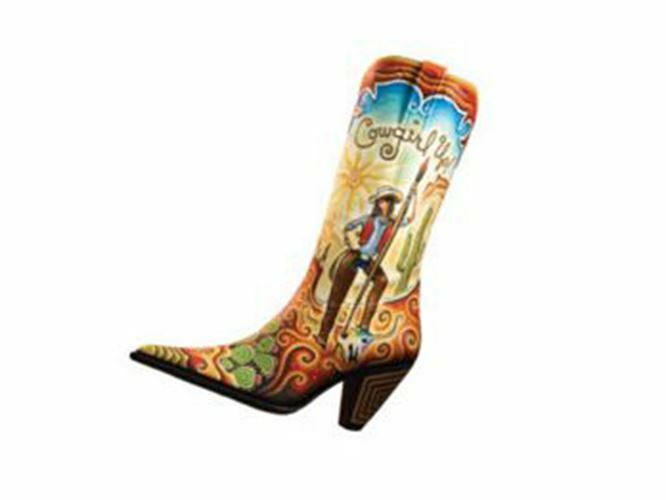 The Desert Caballeros Western Museum presents the 11th annual Cowgirl Up! Art from the Other Half of the West exhibition. This show focuses on art created by women artists who capture the spirit of the West and its lifestyle.